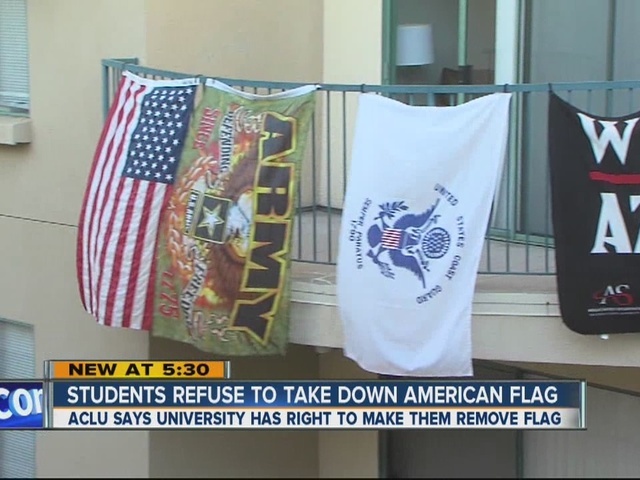 The students claim it is their freedom of expression, while the school argues the flags pose a safety issue. Sophomore Cameron Box, an active duty Coast Guard member, and junior Connor Fenwick, an aspiring U.S. Army officer, said there is no better way to express their patriotism than hanging these flags. "We're just being proud of what we're affiliated with," said Box. The U.S. Coast Guard flag, a U.S. Army flag and an American flag hang on the balcony of their SDSU on-campus housing. The school is not OK with it. "They're trying to say it's a fire hazard, but it just doesn't make much sense," Box said. "If you look up the definition of furniture, it does say it's an ornament and ornaments are particularly designed to beautify something," Fenwick describes. "I don't know anyone who wouldn't say a flag is not designed for outdoor use," Fenwick said. "Why can't we have our First Amendment rights?" Fenwick asked. While the students say they will stand their ground, they may not have much to stand on. 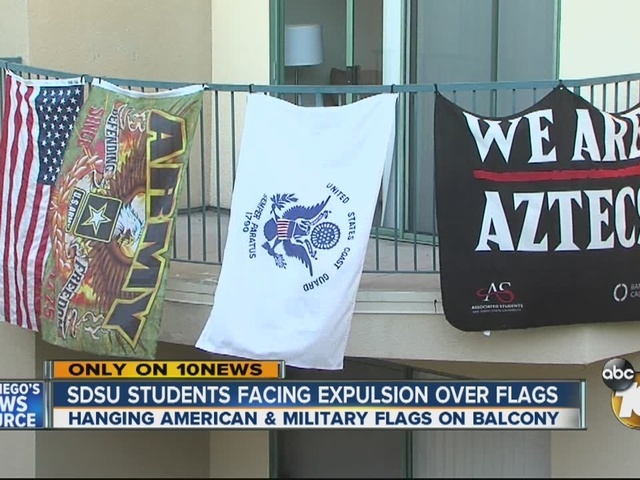 "I think the university is within its rights to prohibit hanging anything from a balcony," said David Loy, legal director for the ACLU in San Diego. He points out that just because the students live in government housing, it doesn't make it a public forum. "I certainly defend the students' right to express themselves and their patriotism, but they probably need to find another way to do it," Loy said. The school said it wants the flags taken down immediately. It says the flag pose a safety concern because it can potentially block visibility. SDSU officials say the students can appeal the decision. However, if they fight it and lose, they could be expelled. Box and Fenwick said if it comes to that, they will take the flags down because they don't want to lose their scholarships.